The FIS World Championships kick off this weekend with snowboardcross, skicross and team snowboardcross at Solitude Mountain resort and the opening ceremonies and Freeski Big Air Final at the Canyons Village. Amongst all the athletes that will be competing from now until the 10th of February, 38 have ties to Park City. 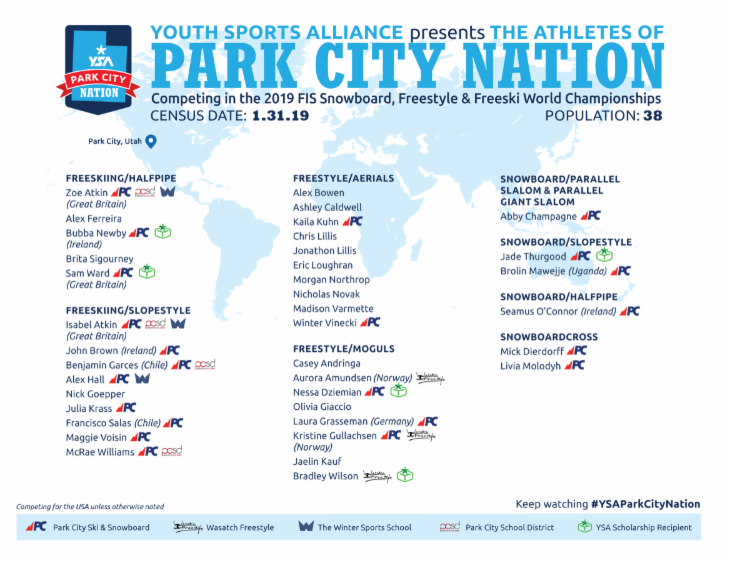 38 athletes with Park City ties are competing in the FIS World Championships taking place at Deer Valley, Park City Mountain and Solitude resorts. 24 of these athletes have trained with local teams while the other 14 live in Park City due to training opportunities. Youth Sports Alliance Executive Director Emily Fisher says the organization is excited to see their efforts to cultivate local talent result in local kids competing at the highest level. Jade Thurgood, Brad Wilson, Bubba Newby, Ness Dziemian and Sam Ward are the five competing who have received funding from YSA. Fisher said they were excited to see how all the Park City athletes fair in the FIS World Championships. Fisher highlighted a few of the many athletes competing. The FIS World Championship is the largest winter sporting event to take place in Park City since the 2002 Winter Olympics. It’s the season when winter-sports lovers try to make it up to the slopes as often as they can. The Get Out and Play program has been making it possible for Park City elementary school students to do so for years. KPCW’s Emily Means has this.